Do You Have Miniaturized Hair Follicles? Advanced Cosmetic Surgery and Laser Center is on the cutting edge of the latest laser procedures to promote hair regrowth and stop hair loss. As a top cosmetic surgeon and expert on hair loss, Dr. Mendelsohn utilizes a comprehensive approach to hair regeneration. Those who travel to Cincinnati for the expertise Advanced Cosmetic Surgery and Laser Center provides will not be disappointed. One of the most popular and effective low-level laser therapies is the Laser Cap™. The Laser Cap™ can provide amazing hair regrowth results by turning the hairs that are falling out, (miniaturized) back to a strong growing healthy hair in both women and men. What is Laser Cap™ ? The Laser Cap™ is a cap that fits directly over the scalp and can be easily covered with a hat or scarf. It has up to 300 diode lasers (no red LED lights), more than any other device on the market, and uses low-level light therapy (LLLT) to promote hair growth. Another plus is that this cap has a portable, rechargeable battery pack, meaning that it can be used during your morning Cincinnati commute. For more information about the specifics of the Laser Cap ™ system, or, to schedule a consultation, call us today! Why Choose Laser Cap™ ? The Laser Cap™ fits around more of the scalp than similar other LLLT options. This makes it a more ideal solution for women as well as men, as it will fit lower onto the forehead than other laser therapies. To see if the Laser Cap system is right for you and your needs, call us to set up a consultation today! Our Cincinnati office is ready to tend to your needs. 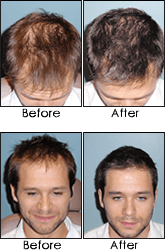 Our team can discuss with you all of the possible options for hair loss cessation and hair regrowth so that you are able to determine if Laser Cap is the best solution for you. This product is made in Cleveland Ohio.